WASHINGTON -- A group of Sept. 11 victims' relatives seeking to have remains of World Trade Center victims removed from the Fresh Kills landfill have hired a lobbying firm here to push for a federal mandate for the plan. WTC Families for a Proper Burial have retained C.L.A. Group to help secure congressional legislation or a White House executive order requiring New York City to move more than a million tons of fine-dust remains, mixed with cement dust, pulverized glass and ash from the collapsed buildings, from Fresh Kills for interment at the memorial planned for the World Trade Center site. The city has insisted that all identifiable human remains have been removed from the debris and cites the enormous cost of moving the huge amount of material. Laurence Socci, C.L.A. executive manager, said he intended to start his lobbying effort by arranging meetings between Sept. 11 relatives and New York and New Jersey lawmakers. "I think they will be listen," said Socci. "I don't know if anyone can live with fact that a member of their family is buried in a garbage heap for all eternity." Mayor Michael Bloomberg has rejected removal as too expensive -- estimating the cost at over $400 million -- and promised "proper tribute" at Fresh Kills. Supporters have accused the mayor of exaggerating the cost. "It is more like $10 million," said Socci. A number of members of Congress, including Democratic presidential candidate Sen. John Kerry of Massachusetts, have endorsed the removal project. Sens. Hillary Clinton and Charles Schumer of New York have also announced their support. Legislation requiring the removal was introduced in Albany but has not won the backing of Republican Gov. George Pataki. Terence J. Kivlan is the Washington correspondent for the Advance. He may be reached at terence.kivlan@newhouse.com. Fund-raising for the World Trade Center memorial could get a big boost today, when Gov. Pataki announces that the nation's four living former Presidents are putting their weight behind the project, the Daily News has learned. Pataki will reveal at a lunch today that former Presidents Gerald Ford, Jimmy Carter, George Bush and Bill Clinton have pledged their support for the memorial and agreed to serve as honorary members of the World Trade Center Memorial Foundation's board. "The fact that these four esteemed former leaders of our country have agreed to lend their efforts to the foundation will help propel the creation of a fitting and lasting tribute to those we lost at the World Trade Center," a source familiar with the foundation told The News. The memorial design was unveiled more than 10 months ago, but officials have had trouble finding a high-powered leader for the gargantuan fund-raising effort. The foundation needs to raise between $400 million and $600million for the construction of the memorial and two cultural buildings at Ground Zero. Pataki and Mayor Bloomberg are scheduled to announce who will spearhead the foundation within the next two weeks. In January, when the memorial design was unveiled, John Whitehead, chairman of the Lower Manhattan Development Corp., and others said they expected a formal launch of the board later that month. In May, Pataki planned to announce that Citigroup Chairman Sandy Weill and mega-developer Jerry Speyer had agreed to serve as co-chairmen. But both men, citing time constraints, ended up turning it down. More than 20 people - a mix of victims' family members, business leaders and civic leaders - now have agreed to serve on the board. During today's speech, Pataki is also expected to provide an update on the progress of rebuilding lower Manhattan. He will largely focus on an "aggressive timetable" for building the memorial and the cultural plans for Ground Zero, a source familiar with the speech said. Gov. George E. Pataki touches the cornerstone for the Freedom Tower on his tour of ground zero. In his report to the Association for a Better New York, Mr. Pataki said work on the tower would begin early next year. Having been eclipsed for most of this year by other issues at ground zero, the World Trade Center memorial returned to the forefront yesterday as Gov. George E. Pataki offered a preview of the completed design, which he said will be ready next month. In describing the memorial - "Picture the old foundations of the Louvre in France or the catacombs at the Vatican" - Mr. Pataki said the column remnants of the twin towers would be kept visible, "laying bare the very roots of the towers as visitors absorb the meaning of what took place here." The governor said that financing of the memorial should be the "first and most important" priority for the $816 million in federal grants that have yet to be allocated by the Lower Manhattan Development Corporation. He also called for an overall spending plan by March, since demands downtown far exceed the available grants. Mr. Pataki said former Presidents Gerald R. Ford, Jimmy Carter, George H. W. Bush and Bill Clinton would serve as honorary members of the memorial foundation, which will raise money for the memorial and the cultural centers. The working members of the board are to be named next week by the governor and Mayor Michael R. Bloomberg. And Mr. Pataki announced that the underground memorial interpretive center, where artifacts and exhibits will tell the story of the trade center and the 2001 and 1993 attacks, will be designed by the Manhattan firm Davis Brody Bond, which is already associated with Michael Arad and Peter Walker on the memorial itself; the Norwegian firm Snohetta, which is working on the museum complex at the trade center site; and Howard-Revis Design of Washington, which specializes in designing exhibits. J. Max Bond Jr., a partner in Davis Brody Bond who accompanied Mr. Pataki at ground zero yesterday, said, "Of course we're pleased, if somewhat apprehensive, since the stakes are so high and the projects are important and demanding." In the governor's fourth progress report on Lower Manhattan, to 420 guests of the Association for a Better New York at the Ritz-Carlton New York in Battery Park City, he was short on big news - when will the damaged Fiterman Hall be razed? what is the status of the West Street bypass? where will an extra $3 billion come from to build a train tunnel from downtown to Long Island? - but long on smaller yet vital details. For instance, he outlined the early construction schedule of the Freedom Tower. Excavation of 18,000 cubic yards of bedrock for the column footings will begin in February, he said. By April, steel and concrete will arrive. A three-foot-thick concrete liner will be built to reinforce the slurry wall around the trade center foundations. Later in 2005, he said, the floor slabs and tower columns of the skyscraper will start to rise. Next month, Mr. Pataki said, construction is to begin on the new South Ferry subway station and on two stations that are part of the planned Fulton Street Transit Center on Broadway. Also next month, he said, deconstruction will begin on the damaged, shrouded 40-story Deutsche Bank building across Liberty Street from the trade center site. After his speech, Mr. Pataki visited the 21st floor of the Deutsche Bank building and then the muddy pit of ground zero, where outlines of the column remnants of 1 World Trade Center have been exposed. Memorial architects Michael Arad, Peter Walker and Max Bond in December will unveil the final model for Arad’s “Reflecting Absence” design for two sunken reflecting pools where the Twin Towers once stood. Arad and Bond walked with Pataki in the memorial area Monday. Arad said later that the access to the memorial from Liberty St. will be decided soon, once a decision is made on where to place the ramp for delivery trucks and tour buses. The Hell they will. Downtowners will never let a few fanatics turn our neighborhood into a giant toxic waste dump. A new board of directors was chosen Wednesday to build, own and operate the World Trade Center memorial. Mayor Michael Bloomberg and Governor George Pataki were on hand for the announcement at 3 World Financial Center. Among the 31 board members of the World Trade Center Memorial Foundation are business leaders, philanthropists and victims’ families. The list includes Disney Chairman Michael Eisner, actor Robert De Niro, broadcaster Barbara Walters, and Monica Iken, who lost her husband Michael in the September 11, 2001 terrorist attacks on the WTC. “I just really feel that Michael is looking down on me now and is honored that I’m here for him and all those who are not here anymore,” said Iken. The four living former U.S. presidents – Bill Clinton, George H.W. Bush, Jimmy Carter and Gerald Ford - will serve as honorary members of the board. “Generations from now, people not just from around America but from around the globe will come here, and they will want to have that same feeling of what happened and the ability to appreciate and understand the magnitude of the sacrifice and the loss,” said Pataki. “There isn't a more noble task before us than to honor the [more than] 2,700 souls who lost their lives on September 11,” said Bloomberg. It took months to put the board together, and it still doesn't have a leader. Several big names turned down the job, so John Whitehead of the Lower Manhattan Development Corporation will be in charge for now. Officials insist they aren't having problems finding a permanent chair. “It's not a matter of picking somebody who can raise the most money and is the biggest philanthropist. The key here is the individual who is going to lead this foundation is going to have a real moral responsibility,” said the LMDC’s Kevin Rampe. The board is responsible for raising $500 million for the memorial and cultural institution at the site. The memorial, called “Reflecting Absence,” will include reflecting pools and sunken voids around the footprints of the twin towers. The site will also serve as a final resting place for all unidentified remains of those killed in the terrorist attacks of 9/11 and February 26, 1993. Before the announcement: from left, Jerry Speyer, Kenneth Chenault, Mayor Michael Bloomberg, Michael Eisner and Gov. George Pataki. The task of raising half a billion dollars to build a World Trade Center memorial, a museum building and a performing arts center will fall to a foundation made up of captains of finance and real estate, cultural leaders, media heavyweights and seven relatives of those killed on 9/11. After months of searching and one awkward false start last spring when two prospective co-chairmen, Jerry I. Speyer and Sanford I. Weill, backed away from the job, Gov. George E. Pataki and Mayor Michael R. Bloomberg were able yesterday to name 31 members of the board of the World Trade Center Memorial Foundation. John C. Whitehead, the chairman of the Lower Manhattan Development Corporation, will head the foundation until the board members have a chance to meet next month and select a chairman. Until yesterday afternoon, even the designated members did not know whom all their colleagues would be. Heading the list of boldface names, in one arena or another, are Robert DeNiro, who has been a presence in TriBeCa for many years; Barbara Walters of ABC; David Rockefeller, who was deeply involved in the original development of the World Trade Center; and Michael D. Eisner, the chief executive of the Walt Disney Company. The roster seems to reflect some geopolitical ticket-splitting, with the chairmen of giant downtown companies like American Express, American International Group and the Bank of New York balanced by Robert Wood Johnson IV, the owner of the New York Jets, who hopes to build a football stadium on the far West Side. "You probably won't find a board of any higher caliber anywhere in the city," said Mayor Bloomberg, who knows a thing or two about philanthropy. "And that's really exactly what is called for because there isn't a more noble task before us." The mission of the nonprofit foundation is to oversee and coordinate fund-raising and construction of the memorial and the cultural buildings at the trade center site. It will also own and operate the buildings. Though the foundation will not formally begin raising money until next year, Mr. Bloomberg all but made the second big pledge as he stood at the lectern in the lobby of the American Express headquarters in the World Financial Center at Battery Park City. "As the mayor of New York and also as a citizen of New York," he said, "I plan to do my part to ensure these projects reach their full potential." The first big pledge may be said to have come last week, when Governor Pataki declared in a speech that the highest priority for the remaining $816 million in unallocated federal grants controlled by the Lower Manhattan Development Corporation should be "to guarantee that we have the funds necessary to build the memorial." Conceivably, then, the foundation may start its $500 million campaign with several hundred million dollars already available. Mr. Pataki had already said that four former presidents - Bill Clinton, George H. W. Bush, Jimmy Carter and Gerald R. Ford - would be honorary members. One of the working members will be Brian Mulroney, a former prime minister of Canada, whose presence symbolizes the international importance of the memorial, said Kevin M. Rampe, president of the Lower Manhattan Development Corporation and a foundation board member. Mr. Speyer, the chairman and chief executive of Tishman Speyer Properties, whose portfolio includes Rockefeller Center and the Chrysler Building, agreed to serve on the board that he would not lead. "I wanted to be helpful but, frankly, it was a matter of time," he said yesterday. Two jurors in the memorial design competition, Paula Grant Berry and Vartan Gregorian, will have the chance to solicit money for the project whose fate they helped decide. No downtown resident is on the board now, but one will be named in coming weeks as the board reaches full strength, Mr. Rampe said. Asked about the appropriateness of including Mr. Johnson of the Jets at a time when the team has so much business with the government, Mr. Rampe said he was a leading philanthropist. "Quite frankly," Mr. Rampe said, "it would have an omission not to have him on the board." Paula Grant Berry. Member of the memorial jury, vice chairwoman of the International Freedom Center. Wife of David S. Berry, who died in the south tower. Sir John Bond. Chairman of HSBC Holdings. Debra A. Burlingame. Founder of 9/11 Families for America. Sister of Charles Burlingame, captain of American Airlines Flight 77, which hit the Pentagon. Russell L. Carson. Co-founding partner of Welsh, Carson, Anderson &amp; Stowe, a private investment firm. Kenneth I. Chenault. Chairman and chief executive of American Express. Michael D. Eisner. Chief executive of the Walt Disney Company. Maurice R. Greenberg. Chairman and chief executive of the American International Group. Vartan Gregorian. President of the Carnegie Corporation of New York. Agnes Gund. President emerita of the Museum of Modern Art. William B. Harrison Jr. Chairman and chief executive of J. P. Morgan Chase &amp; Company. Lee Ielpi. Director. Vice president of the September 11th Families Association, which is organizing the Tribute Visitors Center at ground zero. Father of Jonathan Lee Ielpi, a firefighter who died at the trade center. Monica Iken. Founder of September's Mission, a foundation that supports the development of a memorial park at ground zero, and the wife of Michael Iken, who died in the south tower. Robert Wood Johnson IV. Owner of the New York Jets. Thomas S. Johnson. Retired chairman and chief executive of GreenPoint Financial Corporation. Father of Scott Johnson, who died in the south tower. Anthoula Katsimatides. Assistant vice president for family relations at the Lower Manhattan Development Corporation. Sister of John Katsimatides, who died in the north tower. Henry R. Kravis. Founding partner of Kohlberg Kravis Roberts, an investment firm. Ira M. Millstein. Senior partner at the law firm Weil, Gotshal &amp; Manges. Brian Mulroney. Former prime minister of Canada. Richard D. Parsons. Chairman and chief executive of Time Warner. Peter G. Peterson. Chairman and co-founder of the Blackstone Group, an investment firm. Kevin M. Rampe. President of the Lower Manhattan Development Corporation. Thomas A. Renyi. Chairman and chief executive of the Bank of New York Company. Tom Rogér. One of the founders of Families of September 11. Father of Jean Rogér, flight attendant on the hijacked American Airlines Flight 11, which hit the north tower. E. John Rosenwald Jr. Vice chairman of Bear, Stearns &amp; Company. Jerry I. Speyer. Chairman and chief executive of Tishman Speyer Properties. Anne M. Tatlock. Chairman and chief executive of Fiduciary Trust. Barbara Walters. ABC News correspondent. John C. Whitehead. Chairman of the Lower Manhattan Development Corporation. John E. Zuccotti. Co-chairman of Brookfield Properties Corporation, which owns the World Financial Center. Out of 31 members, I wish they could have named even one community resident (other than, I suppose, Robert Deniro, who really isn't representative). The Chair of Community Board One, perhaps. After all, the family members may come to visit once a year, but we are the ones who are going to have to live with whatever is built on the site (and, indeed, walk through it twice a day to get to and from the train station). I think we have gotten more than could have been expected when the memorial selection process began. Raising the site to street level was a major concession to commercial and residential interests. Robert Deniro is a good choice. He combines celebrity power with a genuine interst in the neighborhood. What sold me is during the debate over narrowing Greenwich St, the restaurant owners who were against the plan because it would eliminate double parking, enlisted DeNiro's aid. Although a restaurant owner himself, he endorsed the plan to narrow the street. Is that political or what? Before Sept. 11 changed everything, the Holocaust changed everything. And one thing the Holocaust changed was the function of architecture, especially public monuments, according to James E. Young, an author of several books on remembrance and a juror for the World Trade Center Site Memorial competition, who will speak at Rutgers University on Wednesday. Since the death of 6 million Jews at the hands of the Nazis during World War II, Young said, monuments have been erected to express not triumph or greatness, but loss. "It's a negative form, a counterpoint to the traditional phallic monuments with a ball," said James, who chairs the Judaic and Near Eastern Studies Department at the University of Massachusetts, Amherst. "The Holocaust actually seemed to affect architecture's assertions about itself." Physically, a sense of loss has often been achieved through the use of "negative" space, as in the descending Vietnam Veterans Memorial in Washington, D.C., or the rows of empty chairs at the Oklahoma City National Memorial, which James would term "countermonuments." On Wednesday at 5 p.m., James will be at Rutgers' Edward J. Bloustein School of Planning and Public Policy for a lecture sponsored by the Bildner Center for the Study of Jewish Life titled, "Memory, Countermemory and the Meaning of Monuments after 9/11." It is a poignant subject for New Jerseyans, who are left with only the memory of 700 neighbors, friends and family members killed in the 2001 attack. "We are interested in subjects that engage concerns of social responsibility and public policy," said Professor Jeffrey Shandler, the center's acting director. Last winter, Young and the 12 other jurors chose a Ground Zero memorial design by Michael Arad, consisting of reflecting pools and waterfalls built over the two square "footprints" of the twin towers. The memorial lets visitors descend to the level of bedrock, and the "box beam" columns that underpinned the towers. New Jersey will also incorporate negative space in its memorial, just across the Hudson River at Liberty State Park - parallel stainless steel walls open at each end to form a view corridor focused on the empty sky where the towers once stood. Young said the Ground Zero memorial has a twin goal of commemorating the loss of 2,749 lives in the towers, while celebrating the heroism of rescuers. In a way, Young said, there will be a traditional memorial at the trade center site that will embody the spirit of triumph, in the form of the proposed 1,776-foot Freedom Tower, which would recapture the crown of world's tallest building for the U.S.
"Something big was always going to be rebuilt there to commemorate what was lost and to replace what was lost," Young said of the Freedom Tower. "For many, that will be a kind of memorial." 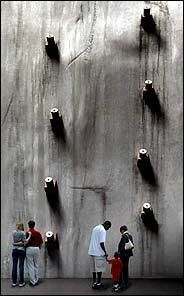 A 70-foot-tall, 250-foot-long section of the twin towers’ original slurry wall, shown in a computerized rendering is one of several remnants of the buildings destroyed on Sept. 11 that are to be included in the trade center memorial. Gov. 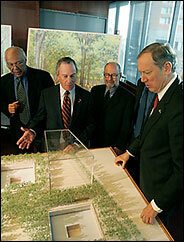 George E. Pataki, right, discussing new details of the World Trade Center memorial with Mayor Michael R. Bloomberg, who was flanked by the architects J. Max Bond Jr., left, and Peter Walker. The World Trade Center memorial will preserve not only the memory of those who died on Sept. 11, 2001, but the remnants - visible and even tangible - of the buildings that died that morning, too. Severed during the clearing of ground zero, many steel and concrete column footings that still outline the perimeters of the twin towers will be made part of the memorial itself, as will a 70-foot-tall, 250-foot-long section of the original slurry wall. Yesterday, more than a year after the world saw the earliest renderings of the plan called "Reflecting Absence," three architects guided their listeners -the governor and the mayor among them - on a trip through the schematic design, showing in more detail the spaces that will compose the memorial when it opens in 2009. Beginning on a plaza forested with some 300 oak trees and a one-and-a-half-acre open area that can double as a civic gathering place for as many as 10,000 people, visitors will make their way down two switchback ramps, each as long as a city block, that will take them 30 feet below ground into the central memorial hall. Here, both pool-filled voids marking the absent towers will be visible through cascading curtains of water, each ringed with the names of the dead. The pools will be centered within, but slightly smaller than, the tower outlines. Forty feet below, within inches of bedrock itself, unidentified remains will be entombed. On this level, the north tower's foundations will be exposed in a chamber more than 60 feet high. Visitors will be able to touch the jagged steel and the rough concrete. "I am looking forward to the day when I will be privileged to set foot and walk down those ramps to the bedrock and, like the family members, bend over and pay my tribute in an appropriate memorial," Gov. George E. Pataki said yesterday. The schematic design represents an important step between conceptual renderings and the working drawings that will set precise dimensions, specify materials and account for the engineering necessary to make two vast waterfalls function, even in the dead of winter. To that end, a mockup will be built and tested in Toronto. Kevin M. Rampe, the president of the Lower Manhattan Development Corporation, which is overseeing the memorial, described the new elements as "simple acts, knitted together to create a powerful memorial at the heart of the World Trade Center site." Michael Arad, now a partner in Handel Architects, won the juried competition this year after he was joined in his entry by the landscape architect Peter Walker of Peter Walker &amp; Partners. They were joined, in turn, by J. Max Bond Jr. and his partners at Davis Brody Bond. At a news conference yesterday at the Museum of Jewish Heritage - A Living Memorial to the Holocaust, the three men took turns explaining the evolution of the design. Perhaps the most significant development is the incorporation of the column remnants around the north tower footprint. These hollow steel boxes set in concrete will emerge from the floors of long galleries with 20-foot ceilings. On the west, the column gallery will open into a far taller chamber that will frame a giant section of the slurry wall, illuminated by a skylight. "These cut-off columns, the foundation slabs, the slurry wall altogether form part of the literal story of survival of that day," Mr. Arad said. "And these are artifacts one can touch and sense the past through them, and through them register the brutality of these events." "We see our efforts reflected in the access to the bedrock footprints in this latest version of the design," said Patricia Reilly, a coalition board member and the sister of Lorraine Lee, who worked in the trade center and was killed in the attack. 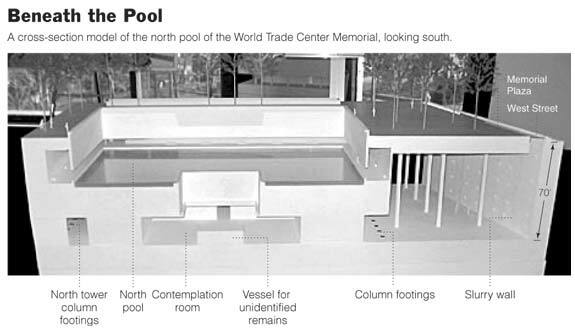 Other aspects of the schematic design include a roughly 60-by-130-foot space known as Memorial Hall, on the intermediate level, where visitors will find directories guiding them to specific names, if they are searching out a particular victim among the randomly arranged displays on the low parapets surrounding the pools. Mr. Bond said that Memorial Hall would also be a "place of contemplation." Another set of blocklong ramps will take visitors back into the realm of the living, among oak trees trimmed to form a continuous canopy roughly 20 feet high. They will be arranged irregularly when seen from the north and south - "just like walking in the woods," Mr. Walker said - but at the same time, they will form orderly rows from east and west, forming what he called "colonnades very much like a cathedral." A tremendous challenge was posed by the changing contours around the site. With considerable effort, the designers managed to set the plaza level at an elevation in which it will be no more than three feet higher than the lowest adjoining sidewalk. Because the plaza will be surrounded by streets, Monica Iken, the founder of September's Mission, said she worried that the memorial might feel like a "beautiful traffic median." Amid all the talk of design and dimensions, Mayor Michael R. Bloomberg recalled that the vastness of the loss was measured in single lives. He noted the presence in the audience of Christine Ferer, a board member of the Port Authority of New York and New Jersey. Her husband, Neil D. Levin, the executive director of the authority, was killed on Sept. 11, 2001. "We will not forget Neil," the mayor said. "Rest assured." The World Trade Center memorial nudged a little closer to reality with the unveiling yesterday of its schematic design, the third public draft of architect Michael Arad's plan to heal the world's most famous scar. The core of the $250 million project is still "Reflecting Absence," the proposal selected last year from among 5,201 entries: a pair of vast square pits lined with sheets of water and filled with pools of air. But Arad's stark concept has been embroidered enough to make these acres seem less like a patch of grief on the city's wound than like a graft of vital new tissue. Landscape architect Peter Walker intends to scatter the four-sided site with about 300 oak trees that will poke through stripes of varied paving stones. What master planner Daniel Libeskind at first envisioned as a sunken lawn, and Arad later raised into a blank plaza, Walker has transformed into an urban grove. Like New York City itself, the park will be a ruffled grid, at once regular and random. Approached from the north or south, the trees will present themselves as a noble jumble, scattered across the flat plaza. Once inside the bosk, those who turn to face east or west will see the oaks snap into orderly ranks. The trees themselves will have a military bearing: Trimmed along their trunks so the branches begin to spread only 20 feet above the ground, they will eventually form a canopied arcade of summer greenery. Follow any row, and it will guide you from the transit station toward the Hudson River - from the city's ancient center to its landfill-expanded edge. Ensconced in this forest is a grassy clearing, which, since everything on this site is inconceivably large, will occupy roughly the area of a football field. On this great lawn, which will hold 5,000 to 10,000 people, the anniversary ceremonies will be conducted every Sept. 11. But it will not primarily be a place of mourning. Inevitably, in greenery-starved downtown, a large patch of grass will teem with vibrantly unmemorial activities: sunbathing, flirting, lunch. Walker's triumph is to have layered life and death. At street level, where the sounds of traffic will mingle with the rustle of water cascading into the memorial proper, the clotted bustle of lower Manhattan will open up into verdant leisure. But nobody who comes to this new park with an iPod or a sandwich will be able to forget about the gaping holes at its center. "Because they are so monumental, the oaks' absence in the memorial is monumental, too," said Arad at yesterday's presentation in the Museum of Jewish Heritage. The dimensions of the twin pits, which outline the footprints of the felled towers, become apparent only as you approach them: two full city blocks of void. They are approached by a ramp midway between them, in the heart of Walker's grove. The descent leads to the subterranean core of Arad's proposal: an enormous Memorial Hall that gives out onto both pits. Walkways lead around the edge of each hole, behind curtains of cascading water. Whether this space has the feel of a vast warehouse or a sacramental space will depend a lot on the details, which are still being worked out by Arad and his collaborators at the firm of Davis Brody Bond. For now, the underground vault looks brutally plain, an aptly unsentimental but potentially sterile reminder that loss is neither fancy nor picturesque. There will be reminders everywhere of the sheer might of the towers that once existed here. Visitors will see and touch the scarred foundation slabs, the stumps of the box beams and a 250-foot section of the slurry wall - that thick, bolted membrane of concrete and steel that divides the Hudson from dry land. This visible relic of survival is New York's Western Wall, our archaeological wonder, and it will reach 70 feet from bedrock to the street. Light will stream down the wall from a glass slit in the paving, so this spare, modernist shrine can be solemn without being grim. The lowest level of the complex will house the most literal reminders of what happened that morning. The Memorial Center, also accessible directly from a still-undesigned entrance at street level, will shelter the mangled remains of ambulances, firetrucks and other memorabilia. The architect Max Bond of Davis Brody Bond said one gallery would be more than 60 feet high, from the foundation to the oak trees' beds - high enough, that is, to accommodate vertically the colossal sections of the original steel columns salvaged from the site. Arad, Bond and Walker have ensured that visitors can return from this new Hades without having to burst right away into the profane liveliness of Manhattan. The exit ramp emerges some distance from the entrance, so each descending Orpheus will not have to look returnees in the eye. The grove is a buffer, but a permeable one. No walls separate the memorial island from the street - only a strip of sidewalk, or a few wide, shallow stairs - so visitors can easily accomplish what thousands of people could never do again after the planes hit: get back to normal life. Inevitably, in greenery-starved downtown, a large patch of grass will teem with vibrantly unmemorial activities: sunbathing, flirting, lunch. I want to be able to have lunch at the WTC plaza and flirt with the pretty women that walk by.